Western Racquet Club, Elm Grove, will be ready to bring QuickStart Tennis to their youngest tennis players on permanent courts in 2011. 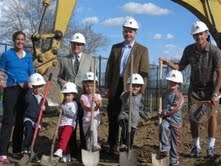 Under the direction of Timon Corwin, Tennis Director, ground breaking was celebrated this fall. The 4 permanent 36’ foot courts will be ready to serve next spring. Designed for students ages 4-8, these courts will be used to launch the youngest tennis players to the sport following the USTA Midwest Section Junior Pathway. The program introduces Midwest Youth Team Tennis and Level 7 QuickStart Tournaments using slower balls, smaller courts and shorter racquets to enable young players to rally, play and enjoy tennis fun. For more information on QuickStart Tennis, the USTA Midwest Section Junior Pathway and to introduce the program to youth in your community in 2011, contact lfreedman@wisconsin.usta.com.